Elsie Carlisle, who was a notable crooner of the 1930s, has died. Born in Manchester she was an established name by the time she was 16. She appeared in many Royal Command performances, among her song title hits being “No, no, a Thousand Times, No!” and “Little Drummer Boy”. For four years she was partnered by Sam Brown [sic] but they split up in 1935. An ideal Cupid is Elsie Carlisle, who entertains as much with her bewitching personality as with her charming voice. She has a knack of getting to the heart of her audience, and it seemed as though she were not to be allowed to make her bow last night. Elsie was not only known for her solo work, of course. Her name is closely associated with the elite Ambrose Orchestra (with whom she recorded the still-popular songs “The Clouds Will Soon Roll By,” “Pu-leeze! Mister Hemingway!” and “You’ve Got Me Crying Again”), but some of her best work was done with other bands, such as the Rhythm Maniacs (under the direction of Arthur Lally), Ray Starita and His Ambassadors’ Band, and Jack Harris and His Orchestra. She was also frequently paired with the singer Sam Browne, with whom she recorded duets in the early 1930s. In 1940-1941, nearing the end of her professional career, Elsie toured the country with a troupe of younger entertainers. The draw that her name exerted is attested by the fact that the group called itself “The Carlisle Express.” She stopped making records in 1942, but she was still on stage and continued making broadcasts through 1945. After this point she almost completely dropped out of the public eye, but it is worth noting that that was true of most dance band personalities; the genre did not really survive the war. Her attention shifted to business ventures, including a ballroom in London and an inn in Berkshire. 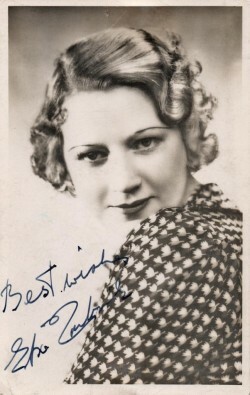 A signed photograph of Elsie Carlisle c. 1941-1942. Another picture from the same photo shoot appears on the cover of the sheet music for “Rose O’Day,” which Elsie recorded in March 1942. Elsie Carlisle is a normal human being, like you or I. She has nightmares about plane crashes — that sort of thing. She is “passionately fond of dogs.” She tells a very sad story of one of her dogs being hit by a bus. She has started to keep greyhounds but is usually too busy performing to see them race. After a decade of turning down offers to come and perform and America, she…actually, it is hard to piece together if she has agreed to anything specific. “[I]f nothing crops up to frustrate my present plans, I shall soon be on my way to America,” she claims. She expresses hopes that the American public will be as welcoming to her as the British one, but that is as much as we get, and I have never seen anything to suggest that she ever did travel to America. This is a fundamentally very silly article overshadowed by a not-very-flattering disembodied Elsie head — which is to say that it is exceedingly fun! Elsie seems to have been just as good at working the press as she was at singing, and she clearly worked hard to earn such commonly repeated epithets as “Idol of the Radio,” “Radio Sweetheart No. 1,” and, on a rare occasion when she was not feeling up to talking to the press, “Distinguished Woman Invalid” (The Dundee Evening Telegraph, January 4, 1939).